Without Design or Sketch: The Story of The Room at Launch LA through October 1st is an immersive experience. Organized by a trio of curators called Rough Play, the rich and fascinating, fully transformed galley features work by Alex Anderson, Beatriz Cortez, Krysten Cunningham, Ashley Hagen, Carla Jay Harris, Jane Hugentober, Malisa Humphrey, Janna Ireland, Cole James, Shoshi Kanokohata and Taidgh O’Neill, Annelie McKenzie, Thinh Nguyen, Joel Otterson, Christopher Reynolds, Jackie Rines, Emily Sudd, Christian Tedeschi, Elizabeth Tinglof, Kim Truong, Axel Wilhite, Robert Wilhite, Emily Wiseman, and Kim Ye. Their exhibition is an homage to James Abbot McNeill Whistler and the Aesthetic Movement. To fully appreciate it, a little history lesson is important. The event that inspired this exhibition took place in 1865, when the Aesthetic Movement in Britain held forth the idea that art should be divorced from any motive other than visual beauty, James Abbot McNeill Whistler was one such artist who fully embraced this concept. In Whistler’s view, the creation and interpretation of art was the responsibility of the artist, and art should improve even upon nature itself. Aestheticism was the precursor of early modern art and Art Nouveau. With that in mind the Rough Play turned Launch Gallery into their own version of the room, following Whistler’s lead with the idea of creating without design or sketch. They have even re-painted the gallery walls in blue. It’s an awe inspiring exhibition, packed with gorgeous pieces, including Ashley Hagen’s cabinet constructed of glass and wood, miniature bricks, stuffed animals, foam, and gold leaf, a decadently beautiful piece, I See Myself In You. Kim Ye’s delicate blue Entice to Ensnare also captivates, its pattern mesmerizing, its form a kind of artistic Venetian blind covering an imaginary window. Carla Jay Harris’ blue and white china bowls are mounted on a wall, each featuring images such as a duo of paired guns. 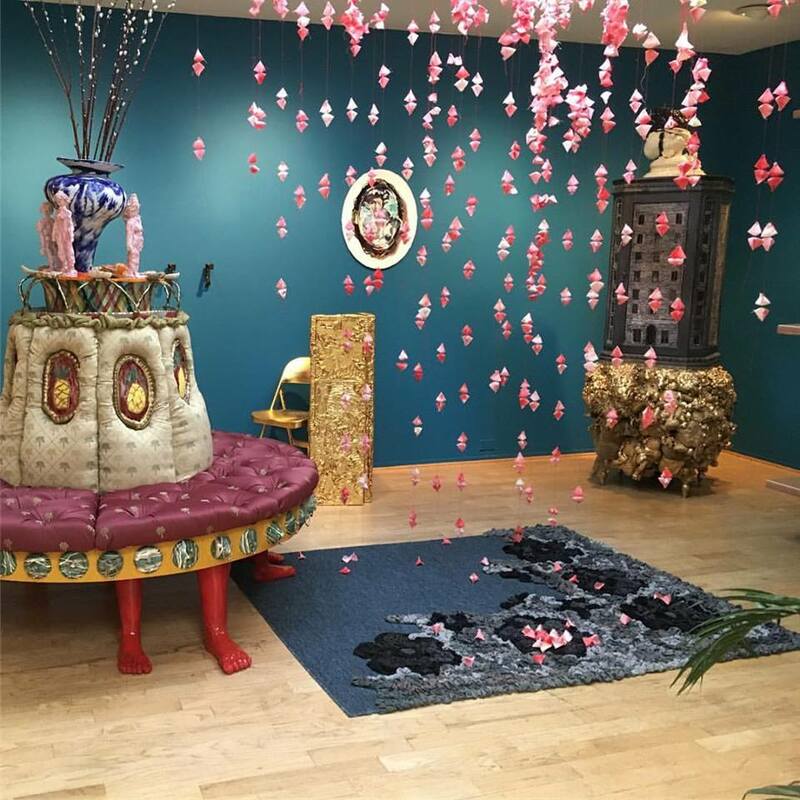 Co-curator Elizabeth Tinglof’s gold-leaf covered folding chair sits in perfect juxtaposition to Thinh Nguyen’s delicate pink flowers flowing in strands from the ceiling. Kim Truong’s single-planed portrayal of fine china – an ode to the china Whistler’s patron had envisioned his dining room as holding – is white on one side, blue on the other, creating a wonderful visual dichotomy, and a play on dimension. Encased in Plexiglas topped by light bulbs, Christian Tedeschi’s green plant takes on a whole new dimension, one that implicates time and space. The installation is both lush and functional. Viewers are invited to go beyond simply looking, and have an involving, interactive experience. They can sit on the gilded folding chair, walk on the rug beneath those delicate pink paper flowers, recline on an embroidered, ornate circular bench. According to Rough Play’s Tinglof, the artists’ took over Launch – with gallery owner James Panozzo’s full permission – and had“a completely different outcome than that experienced by Whistler and his patron,” she laughs. The warmth and lushness of this exhibition absolutely offers a deeply cogent and winning argument for “art for art’s sake.” Enter this room and engage. You can still see Without Design or Sketch: The Story of The Room at Launch LA through this Saturday, October 1st.